There are four serious contenders challenging for the spot in the NBA Finals. The NBA’s Eastern Conference is as competitive as it’s been in a long time. Atop the conference, there are four legitimate NBA Finals contenders. While it might seem like a foregone conclusion the Golden State Warriors are heading for their third NBA Title in three years, the East is poised to at least make it challenging. The 76ers are a very good basketball team with a strong mix of veterans and young star talent. But out of the four best teams in the East, they have the smallest chance of making it out of the conference. There’s no question Philadelphia’s starting five is a forced to be reckoned with. Joel Embiid continues to be healthy and dominant; the 24-year-old center is averaging career-highs at 27.2 points, 13.3 rebounds, and 33.5 minutes per game. Meanwhile, Ben Simmons is a walking triple-double in his second full season. Acquiring small forward Jimmy Butler from the Minnesota Timberwolves was a necessary move, giving the 76ers a star two-way player with a much-needed edge to his game. Offensively, Brett Brown’s squad is more equipped than ever to make a lengthy playoff run. But the Sixers still have work to do to catapult other squads to become the best team in the East. While grabbing Butler was a no-brainer, trading small forwards Robert Covington and Dario Saric has depleted their depth- the former being the team’s best perimeter defender, a glaring weakness in Philly’s defense at the moment. Brown’s bench also scores just 34 points per game, 22nd-fewest in the NBA. Philly needs to bring in a scoring forward (Nikola Mirotic anyone?) who can help off the bench is capable of sliding in to start. Corey Brewer won’t be enough. The 76ers should be in the Eastern Conference Finals conversation for the next half-decade, and they very well may make it out of the East this season. However, as things are right now, they appear to be the fourth-best team in the East. A very good, not great team. Boston was the choice of many to come out of the East before the season started- and for good reason. The Brad Stevens-coached squad had a star point guard in Kyrie Irving, one of the league’s best young talents in forward Jayson Tatum, were oozing with depth at nearly every position, and were getting talented small forward Gordon Hayward back after he played all of five minutes last season. Stevens’ Celtics are still a dynamic defensive team, allowing the fewest points per game in the East at 105.9 and sporting a +6.3 point differential. They’re still built to win in the playoffs. Kyrie Irving is still the same clutch Kyrie Irving. What’s holding them back is a lack of progress from young players and a wildly inconsistent team. Brown has regressed; his offensive role diminished with Irving and Hayward healthy. The 22-year-old is shooting a career-worst 32 percent from three and 44 percent from the field. Tatum has been fine. 16.4 points, 6.2 rebounds, and 38 percent shooting from three are all solid sophomore numbers, but the 20-year-old hasn’t taken the leap towards stardom many expected after his impressive rookie season. Hayward, who’s signed to a max contract, has struggled- he’s barely averaging 10 points per game while getting punked by other teams’ top players in the media. One week, the Celtics are the best team in the NBA. The next, they look like they all hate each other and won’t make the playoffs. I still believe Boston will right their wrongs come playoff time, but the team is anything but a sure bet to come out of the East. No team has benefited more from a coaching change than the Eastern Conference-leading Bucks. Going from Jason Kidd and Joe Prunty — two guys who frankly shouldn’t be or have ever been head coaches in the NBA — to former Hawks coach Mike Budenholzer has elevated Milwaukee from a good team to a borderline great team. Obviously, the Bucks’ success starts and stops with forward Giannis Antetokounmpo. The “Greek Freak’ is better utilized under Budenholzer and is a legit MVP candidate, averaging 26.6 points, along with a career-best 12.7 rebounds and 5.8 assists. Antetokounmpo is shooting less, but he’s never been more efficient from the field, averaging a career-best (by far) 57 percent shooting from the field. His length is being maximized on both the offensive and defensive side of the ball. It’s hard to believe he’s this good at just 24 years old. The Bucks are well-rounded elsewhere. Guards Khris Middleton and Malcolm Brogdon remain above average, high IQ players, while Eric Bledsoe and Brook Lopez are consistent veterans who provide plenty of secondary scoring. Milwaukee’s bench is underwhelming, but midseason acquisition George Hill is a nice fit running the second unit, even if he’s posted inconsistent numbers thus far. General manager Jon Horst will likely keep adding to the bench group. Overall, Milwaukee has the best record and point differential in the NBA with an impressive +9.6 mark. So, why aren’t the Bucks first? It’s because the Toronto Raptors are simply better built to win in the playoffs. Simply put, Kawhi Leonard is the reason the Raptors are likely to come out atop the Eastern Conference. Toronto has choked big time in the playoffs despite being a top team in the East three straight seasons. However, this year seems different. 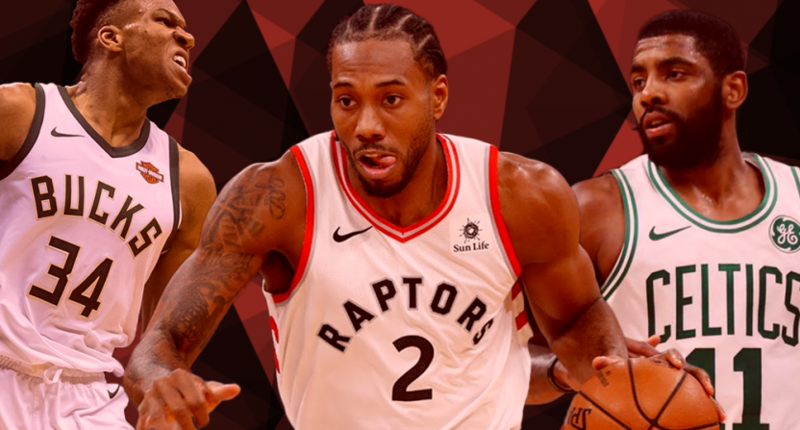 By swapping out DeMar DeRozan for Kawhi Leonard, the Raptors turned a perennial playoff underperformer into a former NBA Finals MVP with plenty of playoff experience. Leonard’s been a beast in his first (and possibly only) season in Toronto, averaging a career-best 27.9 points per game, 7.9 rebounds, and 3.2 assists. Yes, he’s sat out 10+ games, but the Raptors want the 27-year-old to be fully ready to handle big minutes come playoff time. Leonard being “the guy” has rounded out the rest of the Raptors into clear roles. Point guard Kyle Lowry, despite a poor shooting season, remains the floor general and pitbull on both offense and defense. Center Serge Ibaka is playing the best he’s ever played in Toronto, averaging a career-high in points (16.1) while remaining an above average rim defender. Pascal Siakam is the NBA’s Most Improved Player (more on him here). Danny Green is the much-needed veteran shooter who’s a plus defender. Toronto’s depth is also deep. Guards Fred VanVleet, Norm Powell, Delon Wright, and OG Anunoby, mixed with center Jonas Valanciunas (who’s almost back from injury) give the Raptors tons of rotational options. Toronto would likely have the NBA’s best record if Leonard played every single game. But for once, the Raptors intend on being more than a very good regular-season team. They want to be in the NBA Finals, and Leonard gives them their best chance to do so in franchise history.